One of the most beautiful, most dramatic, and different thing you can do for your yard is having water features installed. Water adds a touch to landscaping that no other element can match. The sound alone might be worth getting one installed. This could be something like a small waterfall to a large, all-out cascade, depending on what you have to work with. A professional landscaper can do this job for you and create the vision that you have in your mind of a beautiful waterfall right on your property. If you want a more natural look for your property, think about what you have to work with and talk with a landscaper on what they are able to do to make the area more serene overall. The first place that you would add a waterfall would be in an existing pool or pond in your backyard, because this is the easiest source of water. A waterfall in this area can be refreshing while relaxes the mood. Plus it also looks great as well. However, not everyone has a pond or pool in the backyard, but there are plenty of options even without an existing water source. If you have a garden, placing a small, soothing waterfall right into it can be done easily. An outdoor water line can be tapped as a source for a smaller sized waterfall that is sure to please when you’re sitting in the already beautiful surroundings. Adding the waterfall to any sitting area is also an option. This is something that can relax you and make the entire area seem different than it once was. Keep in mind that every waterfall will look different. If you’ve got an idea in mind, a architectural landscape designer can help you turn it into reality. Perhaps you’ve seen pictures, or maybe you’ve just got a rough outline. Whatever your concept, we can work with you to develop a water feature that expresses your personal taste and fits well in your yard. Each water feature we install is unique, no matter who creates it or thinks it up. The rocks are all different, the land is laid differently and you have all the choices in the world to pick from. One thing is certain though, you’re able to get beauty and peace out of adding one to your backyard. Water just naturally draws people in. And if you’re a wildlife lover, they are great attractants for birds and animals. 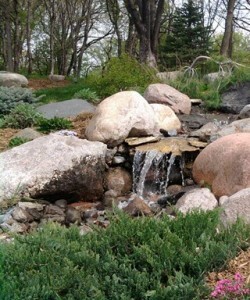 Even if you don’t have any ideas, we can help plan a waterfall for your yard that will please you. Take a look at our Photo Gallery – maybe you’ll find some inspiration! Then give us a call. It’s not too late to get one installed in your yard to enjoy for the rest of the warm weather this year.